Fantastical worlds colliding with reality, inspired by wild life and the nature of things in everyday life with heavy use of repetitive pattern and shape, particularly dots. Sally Paxton is a pointillism painter who says that art and design have always played an important part in her life. She was raised on a farming property on the Murray River in Mildura and that is where her fascination with nature began. Now she lives in the Sunshine Coast in Queensland, on a very different stretch of water, the beautiful Yaroomba Beach where she walks the dogs on the beach, picks up driftwood and shells, explores the bush, watches birds and kangaroos and of course, paints. Sally Paxton is a pointillism painter who says that art and design have always played an important part in her life. Sally Paxton was raised on a farming property on the Murray River in Mildura and that is where her fascination with nature began. Now she lives in the Sunshine Coast in Queensland, on a very different stretch of water, the beautiful Yaroomba Beach where she walks the dogs on the beach, picks up driftwood and shells, explores the bush and watches birds and kangaroos. Her artworks are held in private collections in Noosa, Sydney, Melbourne, Adelaide and Mildura. Imagine fantastical worlds colliding with reality. My work is inspired by wild life, especially birds in their environment, and the nature of things in everyday life. Repetitive pattern and shape, particularly dots dominate my work. I am obsessed with dots and see them everywhere, in everything. 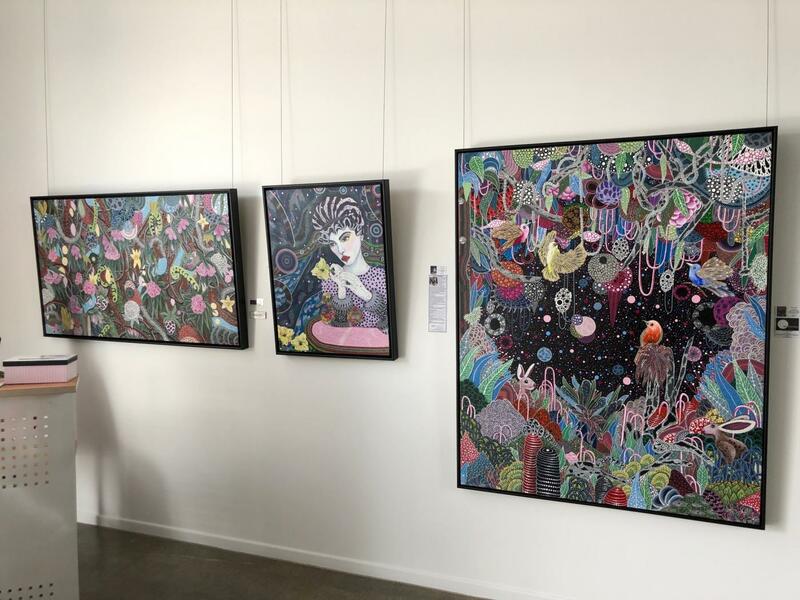 The work explores my connection with the world we inhabit, it is an expression of my reality but also my imagined world. Intricate and delicate forms intertwine in my work, just as my reality and my imagination blend. Once I start a piece it consumes me, I become obsessed and transfixed by it. Through this process a part of me is embedded in my work.